Welcome! We are celebrating our 10th year in business! We are open from March 8th - November at 8am daily. Enjoy exploring Ocracoke Village in a 4-passenger or 6-passenger golf cart. 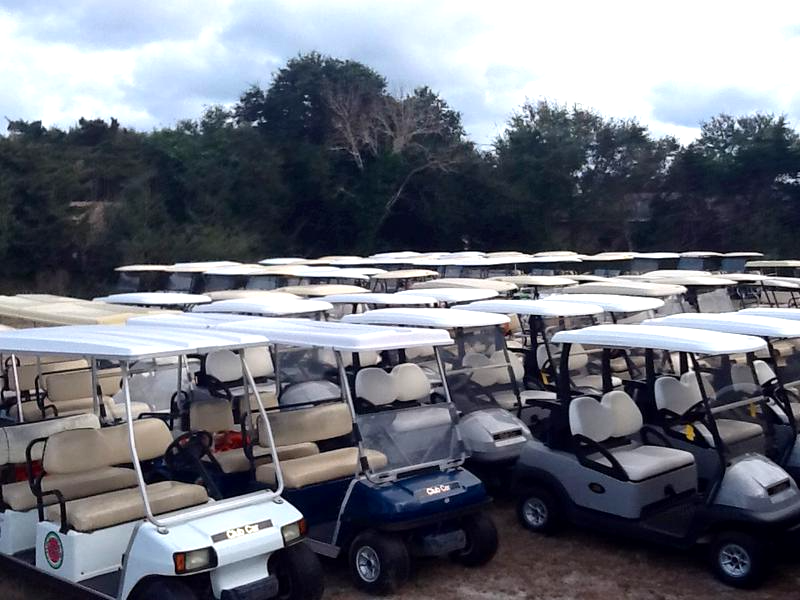 Our fleet of rental carts are ready to roll! We offer rentals by the hour, the day, or the week. We can meet your needs for one cart or many. Call us or stop by for more information. We are happy to help! You'll find us across from the Anchorage Inn, along Silver Lake Harbor, near the south ferry dock. -For visitors making a day trip to the island, we offer cart rentals by the hour. Please come by our office once you are on the island. We have plenty of availability. -For visitors staying on the island a little longer, we offer overnight, multi-day, or weekly rentals. Please come by once you arrive or contact us to reserve a cart for your stay. We do recommend reservations during summer, for weddings, and for other special events on the island. -For reservations needed within the next 5 days, please call us directly. -For advance reservations, please call us or go to our Reservations page to send us your information.